Okay, here's where I'm going to go spouting off about every guitar I want to own. The Parker Fly Deluxe pictured above is the be-all-end-all of guitars for me, and I actually do own it... well, I own one in the same color with the same hardtail bridge, the photo above was borrowed from Ed Roman's Guitar Web Site. While this guitar is the love of my life, and I paid a bit over $1100 for her, I can't help myself... I want so many more, some for the sound, some for the look, some for the sheer coolness of the guitar itself. 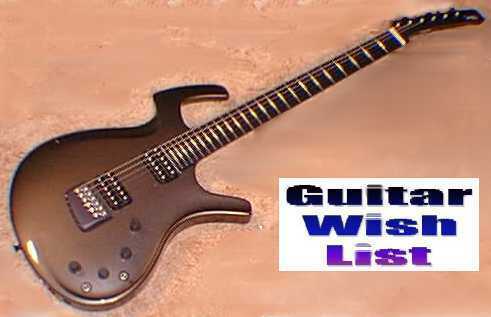 Below is a list of all the guitars I dream of owning. If any of you out there have one or more of the guitars listed below and are interested in selling, by all means send me an email! There's probably no way I could afford some of them, and almost always it'd take me a couple weeks to get finances in order, but I will be interested whenever I can financially do so! Samick Blues Saraceno TV20 Deluxe, in blue/green PLAID. Well, that's all for now, but i'm sure something else will catch my eye very soon and make the list... Notice I don't have any Les Pauls listed.... don't worry, I didn't forget 'em, I just plain hate 'em. If you have any questions or an axe to sell or anything in general I may find cool, drop me a line using the email link either above or in the left frame... Thanks!! !